Santa Anita of the Rockies! 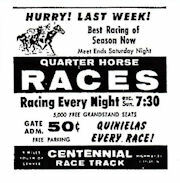 Centennial was basically it's own circuit, miles from any major track it ran a spring to fall thoroughbred meet followed by a short Quarter Horse schedule. It ran mostly lower level claiming races on the daily card with one or two allowance affairs. On Saturdays or Sundays there was usually a minor stakes event. At one time there was night racing and Standardbreds were also run. Originally billed as the 'Santa Anita of the Rockies' Centennial Turf Club (as originally named) never was able to live up to that comparison. Unable to draw quality horses and not being able to compete with nearby Mile High Kennel Club (Dog racing) Centennial closed in 1983. Centennial does have the distinction of being the first simulcasting facility in the country when in 1981 fans were able to wager on the Kentucky Derby. It also provided drive thru betting at an adjacent drive in theater in the seventies. Ironically a new track Arapahoa Downs located in near by Aurora opened in 2006. The irony of it is that the corporation that owns it also owns the Mile High Kennel Club! In 1970 I had the pleasure of being in Denver for the entire Centennial meet that year. All I remember about the track itself was that when you entered the grandstand you went down a flight of stairs to be at track level. As for the racing, it was pretty much the Rollins show, Bradley rode and Lyman trained. There was also Don Lewis a short guy who seemed to have this huge chest, he rode for some outfit that had red, white and blue silks a lot, so I dubbed him Captain America. The handicapping was tough a speed guy like myself as early speed never held up. I do remember a couple of horses one was Silent Sound, Joe Sherman was usually his rider. I remember him because he carried no whip and was my first winner there. Another was Lympia Sea, the horse that followed me home. Shortly after the seventy season I headed back home to New England, the next spring I was looking over entries for Suffolk Downs in Boston and came upon a horse named Lympia Sea. He somehow ended up on the east coast, I played him for old time sake and he won the race. I never came across him again but it was nice to get one more run out of him.